Hi everyone, being that it’s a holiday week, I thought it would be a nice idea to share some of my favorite holiday-friendly roasts and vegetable accompaniments. Hope you folks have a great holiday weekend – we’ll be keeping it quiet here in Virginia as I keep plugging away at the manuscript for my new cookbook. See you next week! Vinegret is the name of a Russian salad that is likely not of Russian origin, but rather borrowed from German or Scandinavian cuisine. In traditional Russian cuisine, salads were pretty rare. Vinegret is often cited as the first Russian salad, first mentioned in the 19th century. Another Russian favorite is Olivier salad, which has a much more interesting history. It was invented by Lucien Olivier, a Belgian chef working in Moscow in the 1860s. The original recipe was a closely held secret and was never truly duplicated. Documents reveal that the salad likely included caviar, crawfish tails, aspic, and veal tongue. Over the years, these rare ingredients were replaced by common ones. Instructions for making Olivier Salad are also found below, as the method is similar. 1) the Lagenaria genus, indigenous to Africa, includes bottle gourds (aka calabash), used as a container and musical instrument. 2) the Citrullus genus, also from Africa, includes watermelon and egusi (whose seeds remain an important food in Africa today). 3) the Cucumis genus, is of unknown origin (but likely the Middle East) and includes cucumbers, cantaloupe, and honeydew melon. 4) Luffa is a genus of fibrous gourds, grown in Asia and eaten when immature, or matured and dried on the vine for use as body scrubs (this is where the word “loofa” comes from). 5) and finally, the Cucurbita genus encompasses today’s subject – pumpkins and squash. As you probably know, the winter squashes we know today – pumpkins, acorn, butternut, and the like – were first domesticated in the New World, and are relatively new additions to other cuisines. But when you look up the origins of other squashes, like zucchini, the results are not so clear. As I dug through recipes for Kousa Mahshi, many would describe this dish as an ancient favorite, as if this delicious stuffed squash was enjoyed in Constantinople a thousand years ago. In truth, zucchini (and all summer squashes) are simply immature cultivars of the Cucurbita genus, eaten while the rind is still edible. Zucchini in particular was first developed in Northern Italy, and not introduced to the rest of the world until the 1930s – a far cry from the Byzantine Empire! 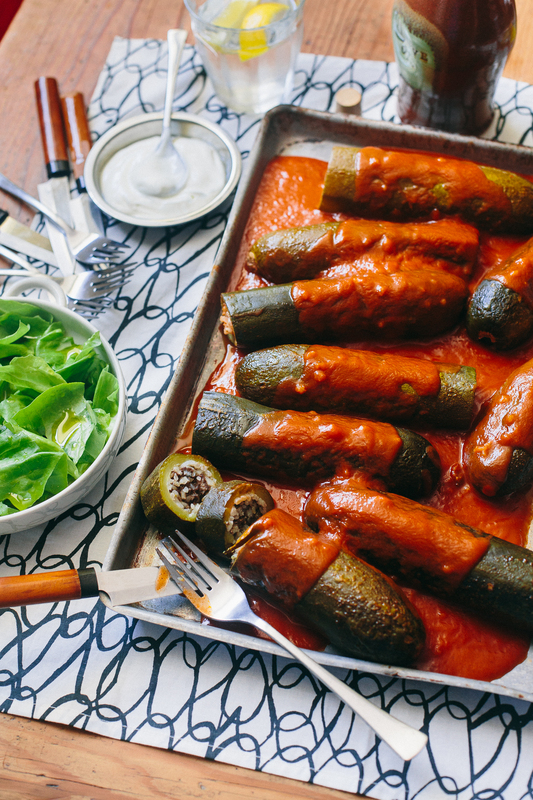 So in the face of these facts, it’s safe to say that Kousa Mahshi is a relatively new invention, likely a reinvention of the older Sarma/Dolma (stuffed grape leaves) dish common in the Mediterranean, Balkans, and Persian Gulf. Shakshuka is a dish of tomatoes, peppers, and poached eggs, ubiquitous in North Africa and the Middle East. Countries across the Middle East, from Yemen to Turkey, claim to have first created the dish, where it then supposedly spread across North Africa. Regardless of origin, I like to think the best Shakshuka embodies many of the countries and cultures that claim ownership of this dish, so I like to incorporate many influences, like Harissa from Morocco, or olives and artichoke hearts from across the Mediterranean. And that’s the beauty of this dish – there are so many possible variations, all readily available in most pantries and fridges, that this dish can be cooked up most any morning; it only takes a few extra minutes to turn your typical fried eggs into something magical. Today’s recipe hosts an all-inclusive mix of possible additions, a tapestry of what you could use – but if you’re missing an ingredient or two, it’ll still turn out spectacularly. And if you don’t have any pre-made Harissa within arm’s reach, and want to capitalize on the spontaneous nature of this dish, simple replace the Harissa with some tomato paste and cayenne (measurements in the recipe below). On a separate note, my friends at ButcherBox are celebrating their two-year birthday (just ahead of our youngest son, Elliott!). To celebrate, they’re throwing in a package of two 10oz ribeyes (a $25 value) for new customers’ first orders – that’s in addition to $10 off that The Domestic Man readers already receive by using my affiliate link. I’m a big fan of ButcherBox, and I look forward to receiving my customizable box every month – stocked full of staples and new cuts of beef, pork, and/or chicken every time. This offer expires at midnight on Tuesday, October 3rd, so don’t wait! I realize that this recipe’s title starts with the word “spaghetti”, but make no mistake about it – the meatballs are the star of this week. Since first developing this meatball recipe for Paleo Takeout, we’ve made it often, at least monthly. There are a few little touches that make the meatballs just perfect: a mix of beef and pork so that the meat flavor is prominent but not overwhelming, egg yolks for creaminess, gelatin powder for a smooth and succulent texture, and bacon for little bursts of umami. One of my favorite ways to describe these meatballs is to say that they’ll make your Italian grandmother swoon. Matter of fact, just as I’m writing this intro, I’ve decided to add them to our dinner menu this week. It seems like every country has a meatball recipe, from the very popular Swedish meatballs to the relatively unknown Finnish meatballs (Lihapullat), often made with reindeer meat. Italian meatballs are larger than most other meatballs and are prized for their tenderness. Gelatin may seem like a strange addition, but it gives the meatballs a velvety texture, not unlike what you’d expect from eating veal. Everyone needs a steady, foundational salsa recipe. One that is worlds better than the jarred stuff you find in the store, but also won’t take a million years to throw together. I like to think that my Simple Salsa Roja easily fits that requirement: unbelievably fresh just as you pull it off the heat, and even richer the following day. Two elements make this salsa unique. First, I like to use one dried morita chile pepper to add a hint of smoked fruitiness. Next, I simmer the salsa with a couple tablespoon of lard, for a balanced bite and smoother mouthfeel. Moritas sound exotic, but they are just smoked red jalapeños (also known as fresno chiles), much like chipotle peppers. The difference between morita and chipotle chiles is that moritas are smoked for less time, retaining a bit of fruitiness. To make things even more complicated, this pepper goes by several other names, like blackberry chile, chipotle colorado, mora chile, or black dash red chile. My advice: check out the dried pepper section of your local grocery store (or latin food market), and if you can’t find a morita or chipotle, pick them up online for relatively cheap. They are worth the extra bit of effort, and since only one pepper is needed for the recipe, one bag will last you a while.